This years collection has been another installment of the Society is a Nest series. This time titled "Fragile" Society is a Nest series II. Society is a Nest please read this post. My art has continued to progress over the years as a quick look at this blog will show although 3 things remain the same. 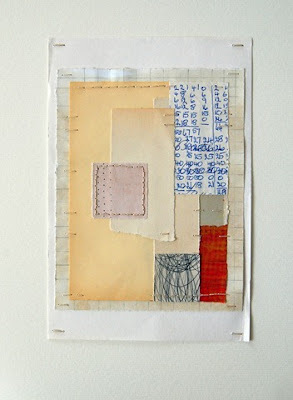 I still hand stitch with 2nd hand shop thread, I still use my own images and I still use recycled papers. No point in reinventing the wheel right? It works for me so I'm sticking with it! The new additions this year are in terms of colours that I've 'discovered' and more importantly the use of nature dyes. A lot of this years collages use fennel, eucalyptus and walnut dye that I have brewed myself. This in itself has been hugely rewarding! I hope you will enjoy your visit to my Lucky Dip ICE blog. Please leave a comment here or on my regular blog so I can come and visit you too! Original blog post can be seen here. This collage is tribute to foster parents. You can see the original blog post here. This collage is a personal favorite of mine and is now part of the permanent collection. Fragile. Society is a Nest Series II. This collage is a personal favorite of mine. It is currently for sale on the Virtual Tart website. This digitally altered photograph of mine features on the back of all the collages along with a brief description of the 'Fragile' theme. Please check back here again. 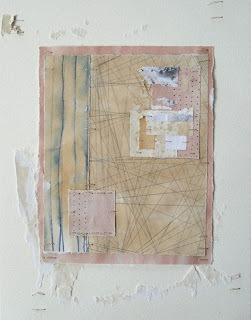 When I have received my collages from the swap I will add them as a slide show. Labels: International Collage Exchange 2011. Lisa, these are all fabulous collage. Sophisticated, truthful, heartfelt and compelling. Congratulations! These are so inspiring! I love that you hand stitch them! I love this collection of collages! Lucky recipients of your ICE collages...they are all lovely. Maybe I'll get one of your next year.